My "Business Model" for Random Topics has always been a small "tight" group of posters. My initial thought was about 50 members, but it could be double that or more. A group of people who know each other to some extent. A core of posters who post most days (nucleus), as well as others who perhaps post less frequently but are still regular posters. I do not want a large (or even medium) place with hundreds of largely anonymous members, nor members who require constant baby sitting/discipline from an army of Moderators. I do want to "Administer" and "Moderate" the forum topics etc... but not so much the actual Members. It's not my job to try and modify people's personality and behaviour, but I would like to keep a few (serious) threads on topic, and keep all posting in defined areas where we can all find stuff. Some threads where people ramble on about any old thing may be required, but stuff gets quickly lost at a site that is all like that. I am HAPPY for the public to just read at RT... this sort of "Forum" is partially about publishing information, thoughts and opinions to the world. (Hiding away in shame makes no sense). Members too are free to read the public areas on a casual basis... but those registered can logon and post if and when they are inspired. Many members read and post now-and-then on a casual basis... hit-and-run post on a specific case. That is quite OK too. There is still a small private "Members Area" for chat, forum issues etc. Access will remain for more involved members only. The "Members Area" is a place for chat and "socializing"... so I do not expect it to be of interest to all anyway. I am still very HAPPY to sign up new members as well, so please spread the word and invite people to look and to email me if they wish to register. I regularly see a LOT of "guests" reading. You are all most welcome to do that. MOST of the place is open and public. I also see Members who just read.. again you are most welcome to just do that, but we would welcome YOU joining in as well. The place can only thrive when people post. This will take anywhere between 30 minutes and 2 hours. We will be taking this server offline during off peak time this weekend either on 12/28 between the hours of 7PM - 4AM PST. During this time you will have no access to your sites, files, databases, and email. The site will be unavailable for a period. Length of time 30mins to 2 hours. One of the functions of a forum is to post information for the public to read and the discussion is intentionally public too. The whole POINT of a Forum is that it is a place where people can "publish" for public scrutiny, information and their comments on it.... so please continue to enjoy the place as guests. It is nuts to have a forum hidden away from the public... even to hide just some cases away seems bizarre to me. Why do that? It seems as if people are hiding in shame? However.... you are also more than welcome to register and join in the conversation, or simply continue to just read, but while logged on. As a member you do have the advantage of better access... lists of current active topics, and a SEARCH function make navigation much easier when you are logged on. And of course you can then comment yourself, if and when you feel inspired to do so. I am happy to approve all registrations - membership at other forums is not an issue. It must be VERY FRUSTRATING to be trying to just read, let alone post, at a site that continually has page loading problems. On the very RARE occasions that there has been a technical problem with the "Server" that hosts Random Topics it has been resolved quickly. Just paddle over here to "The Mainland"
The majority of members here are from USA and by now would have adjusted clocks FALL BACK 1 hour. The default setting at Random Topics is USA Eastern (EST) which will show correctly if you are not logged on. The site host server company is migrating accounts from the server that hosts "Random Topics" to a bigger, better, faster server. So yet another server migration. I'll spare you the technical details, but over next few days there could be some disruption, error message when trying to access. I have no control over this, but it should be rare. If you experience problems, please be patient and retry in a few minutes. Individuals can still adjust personal time zone in "User Control Panel"
In order to apply a critical update, we have scheduled a maintenance window on March 23rd at 12am (PST) for your server 'Nighthawk'. This maintenance is scheduled to last approximately 2-4 hours. During this window, all hosting services will be unavailable (website, database, email, ftp, etc...). Anyway.. the planned maintenance shut-down happened. Apparently no problems? A Tip for New Members (and old). Look to the row of links at the top of the page when you log on. 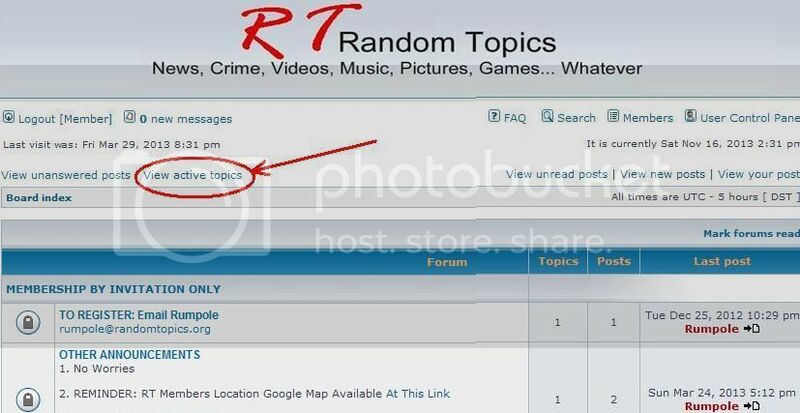 Click "View active topics" That will show you a list of active topics. The Index page gives you an over-view only.... it is handy if you have something to contribute and want to find a suitable area and/or existing thread. There is a PM link bottom left of every post. I welcome people just reading as guests.. using any case info and discussion here even. It is posted publicly for public use, but......... if some dope complains about what he reads here it stuffs things up for everybody.. Gnomeasyin? THX Molly for reminder... AGAIN! I will adjust my own personal setting to keep time shown as US EST for me as well as default time at RT (I keep it at US Eastern Time) This is what you will see if not logged on. To adjust select "No" for "Enable Summer Time/DST:"
NZ clocks also change in a few weeks.. first Sunday in April.. we "Fall back" an hour. The upshot of all that is my time relative to USA changes by two hours eventually. I'll spare you the technical details, there could be some disruption on or around 9-11, error message when trying to access. I'll adjust default time at RT (seen before you logon) I have it set to US EST, but individuals are advised to reset time via "User Control panel" (top right). All you need change is: Summer Time/DST is in effect: Yes/ No SELECT "NO"
All you need change is: Summer Time/DST is in effect: Yes/ No SELECT "YES"
NZ Daylight saving time ends tonight (Saturday)/early Sunday morning. Of course, this makes no difference to USA time, or the default time (US ET) set here at Random Topics. The difference for me is I have to add an extra hour to my local time to convert to US time. US EST will be NZ time plus 8 hours.